Russell Holmes: Topped the ticket in the Sixth Suffolk race. Photo by Alex OwensUpdated: Carlos Henriquez has won a majority of votes in the race to replace Marie St. Fleur in the Fifth Suffolk district. Unofficial results from the city of Boston's election department show Henriquez with a 41 vote advantage over Barry Lawton. It is not yet clear whether Lawton will seek a recount. The Fifth Suffolk race was the city's closest contest of the primary election as results see-sawed between Henriquez and Lawton throughout Tuesday night. Finally, after 11 p.m., the city's website was updated with the results from a straggler precinct that gave Henriquez his 41 vote margin. State Senator Sonia Chang-Diaz has defeated her primary opponent Hassan Williams in the Second Suffolk district, according to unofficial results gathered by the Reporter, which has correspondents with both campaigns tonight. Chang-Diaz faces a clear path to re-election in November. Nick Collins defeated three other Democrats to win his party's nomination in the hotly contested race to succeed Rep. Brian Wallace as the Fourth Suffolk state representative. Collins beat out his closest rival Mark McGonagle, who made an appearance tonight at Collins' victory party in South Boston. Collins will face-off against Republican Patrick Brennan in November. 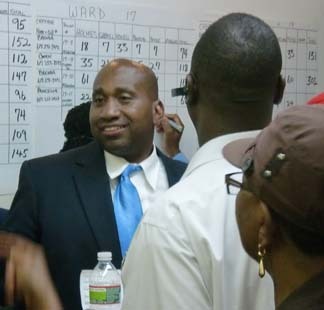 Russell Holmes, a businessman and community activist, has topped the ticket in the Sixth Suffolk Democratic primary. Holmes will replace outgoing state Rep. Willie Mae Allen, who is retiring in January. There is no Republican opponent for Holmes in November.